Woe betide the young hack who falls foul of Private Eye. Ian Hislop, the satirical magazine’s quick-spirited editor, has perhaps more of a public profile, but the comedy writer Nick Newman, with whom Hislop has been letting off literary whoopee cushions since school, is a mainstay of the cartoon pages, when not scripting for Dawn French, Harry Enfield and their like. The only consolation, therefore, in the task of detailing the turgid qualities of their latest collaboration is that I’m unlikely to be nominated for Private Eye’s Order of the Brown Nose. Hislop and Newman have found appropriate heroes in this schoolboyish tale of satirical derring-do. The Wipers Times was a sardonic bog-sheet published by junior officers in the trenches of the First World War (“Wipers” being Tommy slang for Ypres). Originally a (better) BBC TV comedy featuring Michael Palin, it has been stripped down for this tour, beginning at the idyllic Watermill Theatre in Newbury. There are moments of affection for the mechanics of print, especially at the almost sacral discovery of a Josiah Wade Arab printing press, left behind Belgian lines just in time to be discovered by our bunch of Brits. If only Hislop and Newman’s script taught us much about the content of the ensuing publication. Instead it subjects us to the leaden life histories of a few thinly drawn Blackadder extras, burdened by a lumpen framing device in which the stiff-lipped Wipers Times editor, Captain Fred Roberts (a cardboard James Dutton), applies for a newspaper job after the war. Naturally the evil editor, hidebound as he is by portentously laboured commercial imperatives, doesn’t recognise his talent. “You are doomed, Dead Tree Press, DOOMED,” one almost hears Hislop bellow. The most obvious sign that Hislop and Newman aren’t stage writers is that they have crammed the production with enough characters to stretch the salary budget of most fringe venues yet not one is given time to breathe and develop. The director, Caroline Leslie, at least does an admirable job of keeping them from overcrowding across the Watermill’s matchbox stage. 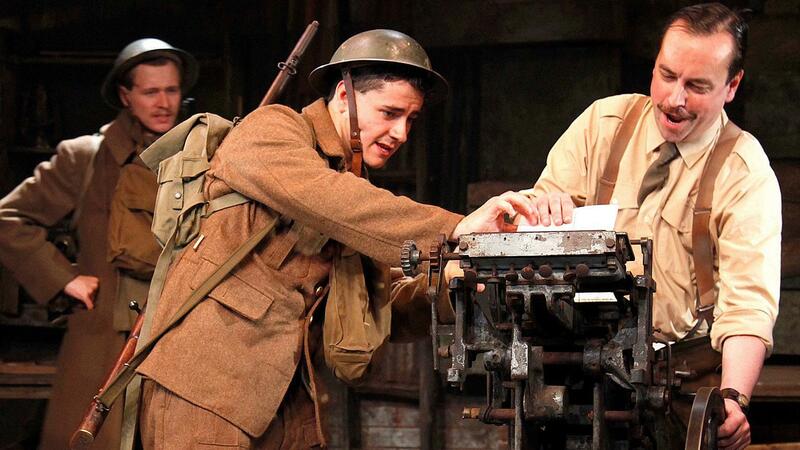 The comic revues, dramatised from the original Wipers Times, are a delight — if only there were more. Yet the plot drags. Dutton is given 2D lines and spins them into a 1D performance. Most disappointingly, from the figurehead of modern British satire, there’s no defence of why publications such as The Wipers Times matter, other than general muttering about morale. Almost in passing, we are told that the Germans feed on hate, the British on humour. Yet there’s no great cultural examination here. Only missed opportunity.